I’m not sure who’s more excited about this ladder – me or my husband! Extend-a-Step graciously sent us the most awesome ladder ever. The general concept of this ladder is that it is compact, portable, light-weight, made from aircraft quality aluminum, and super easy to store making it a snap to use. But in about 5 seconds flat, it goes from compact to over TWELVE FEET TALL! Wowza. …Or reaching those awkward too-high plant shelves that are so popular in newer homes. With two wild monkeys for children, reaching the plant shelf for random toys is a weekly occurrence! Extend-a-Step is also great for reaching those out-of-reach spaces that a traditional ladder can’t, such as inside a stairwell. 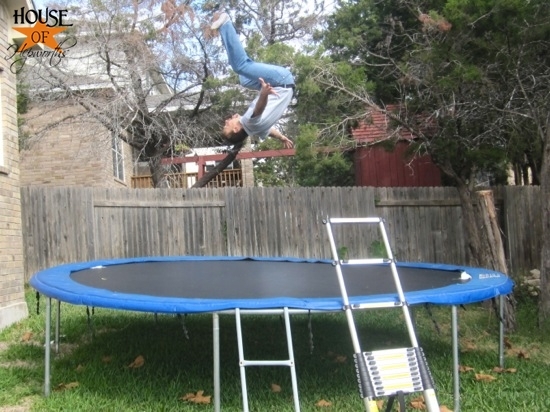 …so you can then show off your mad back flip skillz. 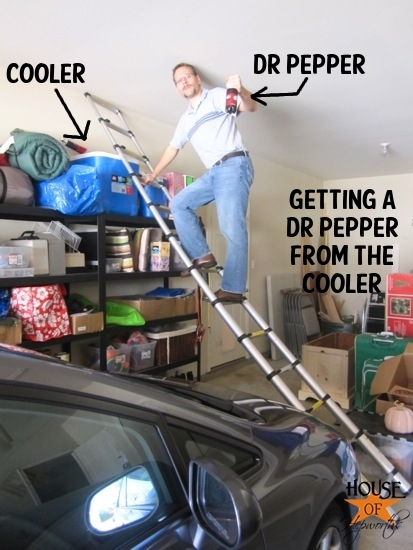 And most importantly, so you can reach your cooler to grab a nice cold Dr Pepper. This lightweight totally friggin’ awesome ladder even comes with a carrying case, making lugging it around even easier! And cuter. * please note, Ben usually does not have a handlebar ‘stashe. He grew it for Movember. Ha, Ha, Ha… your post was so much fun! I could definitely use this ladder, as I was up on our old rickety ladder this year hanging Christmas lights. Ha!! My favorite is DEFINITELY the silverware drawer!! That’s priceless. Great idea of a product, too. Thanks for the chance to win! My kids went to the dentist today and had no cavities. I love the way you created a photo demo for this ladder. So funny & believe me, I needed a good laugh today! Thanks for the giveaway. We NEED this to get in our silverware drawer too! Thanks for the entertaining post and awesome giveaway! I like Extend-A-Step on FB and would love to win! This is the first time I’ve been on your site (came over from Pinterest) and just have to say this post was very funny! The pictures of the silverware drawer and mats on the deck are hilarious!! ur husband is an uber trooper!! props to him! I totally need this to paint our stairway too. I love that it’s so compact! I now ‘Like’ Extend A Step on facebook. Thanks for the giveaway! the boyfriend would love this-i would be, like, the best girlfriend ever if i got this and gave it to him. a ladder is literally on his xmas wish list! i love how your hubs was able to show us how this works-those daily workouts to reach the silverware drawer are just getting to be too much, lol. I liked them on their FB page! This has to be one of the most funny posts ever! Your husband is such a sport to pose for all those pictures, although I suspect he had just as much fun as you did. 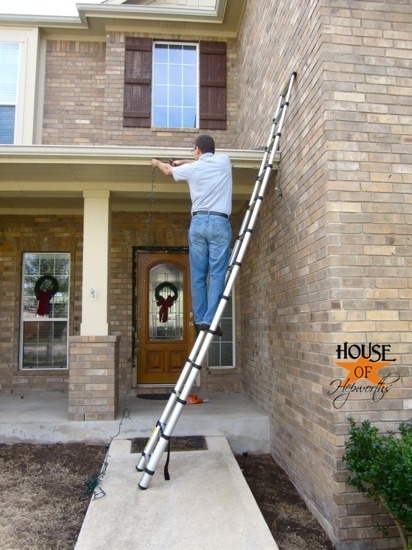 I would really like to win this ladder, because my husband wants to get rid of the pigeons on our house with a pellet gun and says he has to do it that way because he doesn’t have a tall enough ladder. Um… help? You are too funny! I love the Dr Pepper Picture! I would love to win a ladder! Thanks for the great giveaway!! Loved your post, would love it even more if I could win…LOL! This is a great giveaway and my husband defintly needs something like this.. lets just say he is challenged in some area’s.lol! I would use this ladder by finding projects for my husband to do! 🙂 Or maybe I’d extend it up to put santa feet in the chimmney. or maybe extend it up to spy on my neighbors (ok, I totally wouldn’t, too creepy!!). Thanks for the laughs! I loved your post! Oh my goodness! I love this post, and the awesome pictures of the ladder in action 🙂 My hubby and I were just talking about needing a new ladder, we recently (well less than 6 months ago) moved into a new house and our old ladder just isn’t the right size! Plus this looks perfect because it can always be used as a step ladder. Hope you’re having a great day!! great pics; this giveaway comes with the model, right? 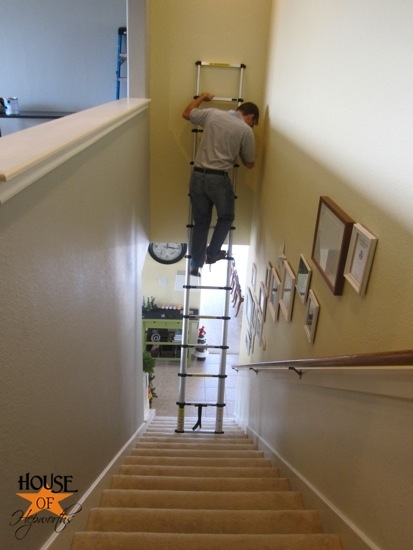 I’ve got a stairwell that needs painting…..
Holy cow, that is one cool ladder! Extend-a-step could help me reach new heights in helping me achieve houseproud status! Thanks for the giveaway! Your husband sure is cute and so sweet for helping out? Does he have a much, much older brother? Or is his father single? Just kidding about the brother/father bit. Seriously love this ladder. 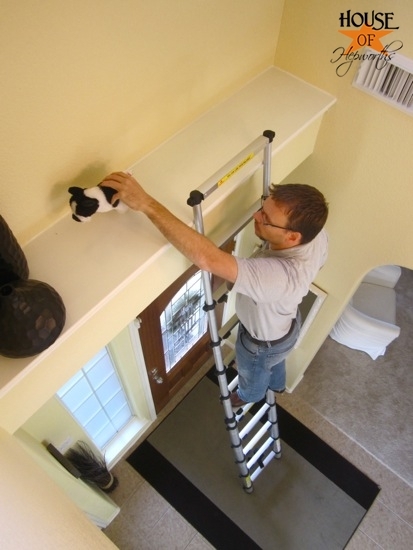 This ladder solves the #2 problem with extension ladders… having a place for one! The #1 problem is a bit more difficult to solve… my problem with heights!!! 🙂 Nice product, great giveaway! Yes, please….I’d like to have this for me – hubby would be SO jealous! Oh, my son, too! We would use it to climb up and get our avocados off our tree…and maybe on the roof…oh, my dad would be even MORE jealous!! Is it wrong to have fantasies about this ladder? I would get some legit handy-chick cred if I had this. Love the post! This ladder looks awesome!!! Maybe this would help my husband put up Christmas lights….. I would love to win this ladder in your giveaway! I’m new at reading your blog, but have really enjoyed it so far! Wooo-eeee that is an awesome ladder! Love the action shots! If I won, my Mom would be soooo jealous. She loves to buy fancy gizmos that fold up or have multiple purposes. Seriously the funniest thing I’ve seen in a long time! I LOVE reading your blog!!! I totally am in love with this ladder!! I could use this for SO many different thingys!! I like Extend A Step’s FB page! I let Extend-a-ladder know you sent me to their FB page! Thanks for hosting the give away! I love how you showed “all” the uses of the ladder! Perhaps it will help my husband put the silverware away too! 🙂 LOL! I just peeeeeed myself…Poor Ben! I went on over to the facebook page and told them that you sent me. I would love love love to win this for my hubs! I would make him pose for photos, blog about our DIY adventures and link up to you so you could be as entertained as I was after reading this post (well, I’m not sure I can be as entertaining, but I’ll try!!) Thanks for the chance to win!! I liked them on Facebook and left a comment!! Why do I need a super-duper, new ladder? Because we routinely lock ourselves out of our house and the only way in is a broken screen in the back of the house. Problem is that it’s about 12 feet above the patio. The ladder we use is broken and quite dangerous, so a new safe model would make the climb less frightening! Love your blog and your writing style (btw)! This would get me so many points w the hubby!!! It would make my day since we live in a RV and space is at a premium!! Love your site, keep up the good work! Oh man, I really need access to my silverware drawer! We’ve been eating with our hands all this time….This ladder looks incredible! We just bought a house with some hard to reach places and not a ton of storage space so this would be the perfect solution. Thank you so much for keeping your blog “real” and humorous! I liked Extend A Step’s FB page because I’d really like to win so I can make my husband do what you make Ben do…lol! Hilarious post! 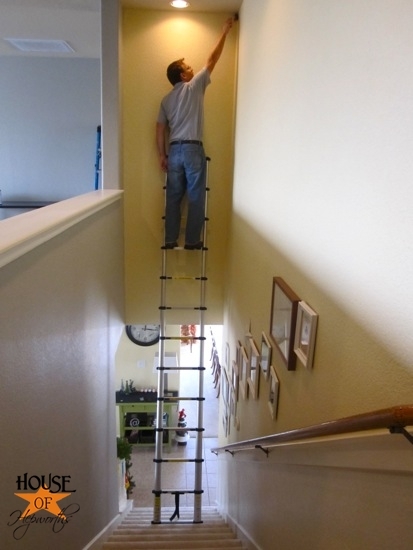 My hubby could totally use this ladder for christmas lights! OH…and on the I think I just peeeeeeeed myself comment…I wanted that to be an entry too…but I forgot to mention that because well…I was laughing THAT hard! LMAO! A must have for reaching that tall silverware drawer! I liked extend-a-step on facebook! This post just made my day! I can picture my hubby getting so excited over this ladder!!! Loved this post and would love to win a ladder! My hubby would love this! He went to work with his in the back of his truck the other day and someone took it! Now we are ladderless (I know not really a wordd) we could really use this. I soooo need that right now. We need to hang outside christmas decorations and a tall ladder is in order. OK – so I have to hurry, b/c it’s time for me to go to my next class (I am the teacher! ), but this made my day – love the photos! I need this, b/c my husband said no when I said the sconces needed to face down so we could change the light bulbs. He had them installed 18 feet high, facing the ceiling! We built 6 years ago, and need to change the bulbs quickly – only one (of ten) is still working! Wahoo!! My 6’9″ painter hubby does not always need a long ladder and hates dragging all his ladders to job sites. Would be FANTASTIC to keep this one in the truck easily!! I hearted them on FB! LOL, love the review and pictures. This is a great product idea. No more worrying about how I’m going to get a gigantasaurus ladder home from the Home Improvement shop. My 5′ ladder just is not cutting it in my vaulted ceilings. Thanks for the chance to win!! I “like” Extend A Step Telescoping Ladder on FB and mentioned that House of Hepworths sent me! You are so clever! I’d love to win this! My husband is always mocking me for being so vertically challenged…. 🙂 I am always having to wait for him if I want to hang something which means it usually takes forever. 🙂 Having this would be AMAZING and very helpful! Thanks for the giveaway! This is a seriously fun ladder and a seriously fun post! Now I’d like to see him shake Santa’s hand upon his arrival on the roof! K? K. I’ll be watching for that one! 😉 Thanks for this great chance to win! My boyfriend complained to me the other day after I made him hang Christmas lights outside WITHOUT a ladder. I told him when he finally decides to marry me, that we can REGISTER for a ladder for him 🙂 He didn’t bite- here’s hoping! Thanks for the giveaway! Wow! What an amazing ladder. Thanks for a great giveaway! My 70 year old mother and I climb a ladder almost everyday doing roofing estimates for her roofing company in Florida! This would be great to replace our 40 year old aluminum ladder!! Ah! This would come in so handy since we’re moving soon! We’ve been stuck in a can’t-do-anything-rental apartment for the past two years so it’s time to start DIYing! An Extend-A-Step would be great. We just built a new home that has stairs. After seeing how the painters rigged up a contraption to paint the stairwell, I was wondering how we would ever hang pictures or repaint! This would be great!! I would love to win this. We have one of those plant shelves above our front door. Never knew what to call it before. Anyway, it has a deflated balloon and some paper airplanes hidden up there that we can’t reach. If I won this, I could finally clean that area! I also liked Extend A Step on Facebook! 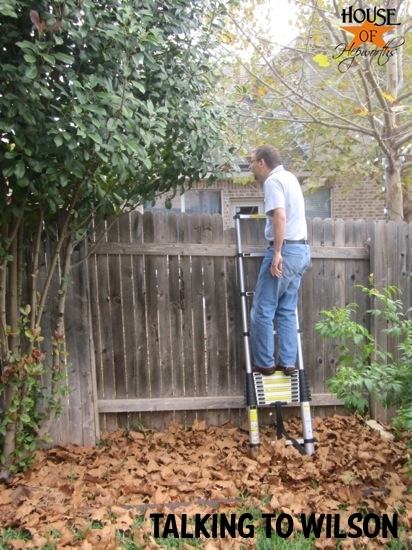 Love all the pics of your hubby using this cool ladder. Would be super awesome to have one of these (maybe my hubs would get a few more things done…ha!). Thanks for the chance! Love Dr. Pepper…and this ladder! Very Cool ladder… get it out again the toilet paper roll is empty, he may have a hard time reaching it! Love your site and decor ideas! So, I bought 7 wreaths for the front windows of our house this past weekend. I got home so excited to put them up. I decorated each wreath with a bow and got to hanging them. Unfortunately, two of the windows (in the middle) don’t open so I can’t put them up. This ladder would be able to fix that problem and help the outside of my house! Come on, ladder! Mama needs some lights up on the house! I liked them on FB… so I can’t give it as a Christmas pressy since the hubby just texted me from work “liked ladder?”. LOL! So this has absolutely nothing to do with the ladder but I have to say I totally squeeled when I got to the picture of your kitchen. That ladder would be PERFECT in my family! My mom is always working on home improvement projects but, since we just moved into a smaller apartment, our current ladder is a total spacehog! This ladder would be wonderful since it is so safe but so compact! My husband’s current plan for getting on the roof to hang Christmas lights involves scaling the house. I don’t see this ending any other way than with a trip to the ER. Please save me from that ER trip! I love the pictures of Ben, especially stepping on the ladder to put away utinsels. We have GOT to paint our staircase, but like you, it extends from the bottom floor to the second story, and in quite a tight area. Needless to say, every worse case scenario (and even the totally impossible, but yet I imagine it one) goes through my mind. I would like to keep my husband around for many years, so this thing would defnitely help me out! You have the best sport of a hubby ever! There is no way my hubby would have modeled like that. Hmm, something not boring . . . I finally bought a set of metal stamps from Harbor Freight this week. I live 10 minutes away from one, but it took me flying 2000 miles across country to visit family to finally do it! I love how your husband was getting in on the fun. What a good hubby. Thanks for the giveaway, what a cool product! I love it! The silverware drawer picture was awesome! Your husband is a good sport! My husband doesn’t normally read your blog, but happened to see and read and crack up at your shower/ soap holder post. Then he was standing near me today when I started laughing out loud at this post and enjoyed it with me. We’d love one of these ladders for our ridiculously tall shelves and light fixtures! why oh why do people keep leaving their dirty clothes at my house!! Oh wow! What a cool ladder! 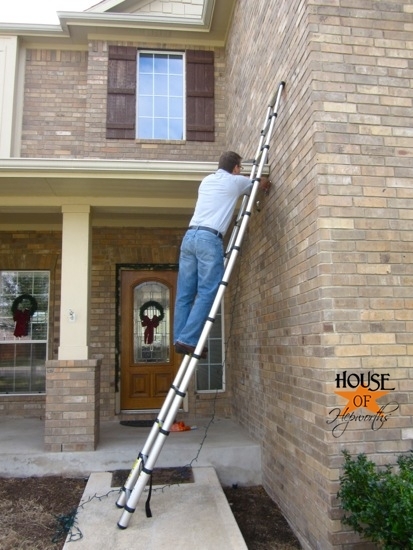 My hubs was just telling me he wanted an extension ladder for Christmas…I would love to give him this one! I especially need him to use it to get my Dr. Pepper down from the cooler for me. He might like to use it to talk to Wilson though. Thanks for a good laugh! Loved the post. So funny. Made me laugh so thanks. So, I really need this ladder since I am barely 5 ft tall. Thanks. Liked the ladder on Face Book. Looks like a great product. If I win this ladder I’m buying a trampoline to use it with! I would love me a nice extend-a-ladder so I can ummmm…reach the Diet Dr. Pepper on the bottom shelf in my frig!!! Giggle. OMG the pic of your husband using the ladder to get into the silverware drawer really made me laugh! I am so happy the Movember is over! I am a high school teacher and so many of my students didn’t shave for Novemer. Do you know how much cringing I did to see these teenage boys walk into class with their barely filled it chins because they can’t grow facial hair yet?!! Hehe, too funny. I’ve been told our ladder is totally unsafe. I would hate to find my hubby lying on the ground near our rickety old ladder. Therefore, we really need this!! Love it, I could paint my walls without another near death experience! I liked Extend-a-Step on FAcebook. SOOOO excited! I actually looked at ladders this weekend. Love your blog and appreciate your honesty and humor! Oh please? 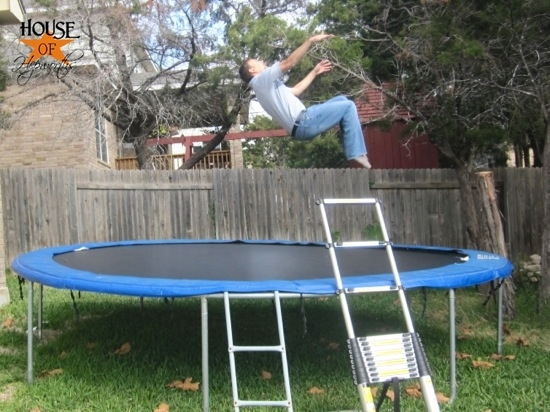 I have almost none of those things (no trampoline or super high shelves, or wicked backflip…) but I sure could use a giant telescoping ladder! This is SO great! My husband needs this before he actually hurts himself with our ladder!! Such a fun post! Thanks for the great giveaway! wow. I never heard of such a ladder. guess I have been in the dark ages as far as ladders are concerned. would love to win it..and then put my hubby to work with it. 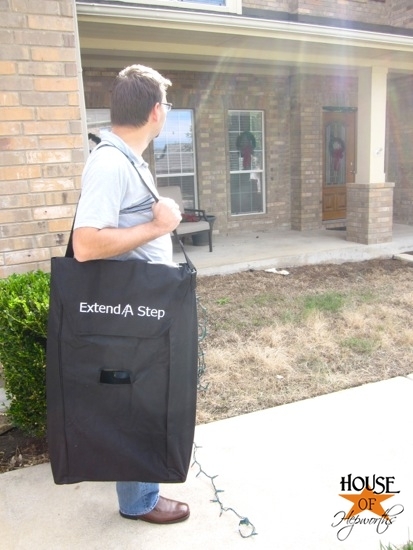 I liked Extend-A-Step on FB and would love to win! You have the best give aways!! Ha! I love this post! 🙂 & I would love this ladder! Maybe it could help small dogs reach tall beds? Sneaky children reach forbidden candy? Short Mamas dust the top of the fridge? I lovity, love, LOVE that ladder. WANT! You guys are just so funny! It does look like an awesome ladder. Awesome!!! Great pictures – plus, I could use a Dr. Pepper about now also! Looking at how practical this ladder is, why would you need any other? We’ve been dreading painting our stairwell – please send Extend a Step STAT! Are you kidding? This thing is awesome. It would make cleaning out the fridge so much funner (is too a word) and easier. Also reaching the liquor cabinet above the fridge, necessary after cleaning! Wow my husband needs this! We do not own a ladder, and we need one fix up our house. Ok i have to say that i think your Husband is awesome for being a good sport and staging the pictures for you! i don’t know what to say that is funny, but i will share with what i think is funny at the moment… my 11 month old daughter thinks its funny to “honk” her own nose and she even says honk when she does it! and then she laughs hysterically! ps. i like Extend-a-step on facebook and let them know you sent me! You crack me up Allison! This seriously reminded me of a cheesy late night infomercial haha thanks for the chance to win. This Ladder is brilliant! All I have is a small two step thingie and that really won;t help me when I start painting. Even those I have high ceilings… really high ceilings… space is crucial and this ladder is just beyond brilliant! I can’t reach my Diet Dr. Pepper either…Please pick me to win the ladder! My poor husband is getting ‘old’ so he needs a more lightweight ladder like that to do my bidding!! Great post – your husband is something else!! I really need this ladder – my lack of height is a downfall! Seagull poop on my skylight. HELP! With this ladder I could finally get to the spider webs on the ceiling that have been there since Halloween!!! 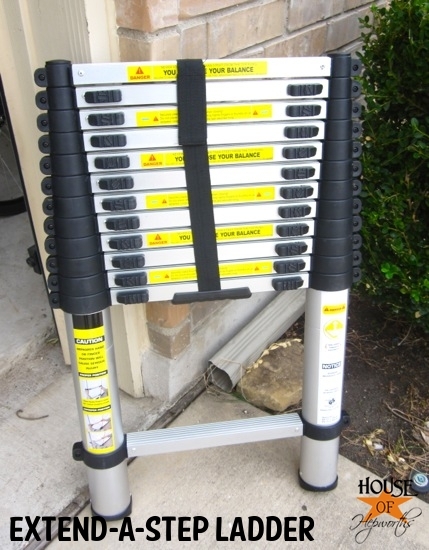 Liked on Extend-A-Step’s facebook page – got to have this ladder! wow awesome ladder and so many uses! My fav was talking to Wilson! and Christmas lights> My kids think it’s lame taht we don’t have any lights up on our house. If we had that ladder we would definitly do lights! This was a fun post to read! Your husband was cracking me up, what a good sport. May favorite pic is the dog wondering why DH is getting the rug on the ladder rather than just standing on the deck! Also love the “real” picture of your kitchen. So glad to see a non-magazine photo on a blog! I would love this ladder!! Extend a step looks just like it would be expecially handy and compact for a small senior apartment aswell as any homeowner. haha!!! This post was hilarious 🙂 Thanks for the laugh. I would LOVE this! And by the way – I live just up I35 from you in Belton! Small world! P.S. I just bought my 1st Rodney White painting! I lurve it! It would be sooooooo awesome to win this ladder! I need to paint the stairwell again and believe me I don’t want to repeat the way I did it the first time– SCARY!!!! I would LOVE this for my hubby! This would be awesome to have. Thanks for the opportunity. I liked them on facebook! I could use this ladder to find new hiding places for our Elf on a Shelf. Running out of places out of reach of my little ones but within my reach without busting out the old school ladder. My DH doesn’t know this yet, but he will really need this ladder come spring. I just need to finalize the paint colors!!! Thanks for an awesome giveaway. Loved love loved LURVED your post yesterday! 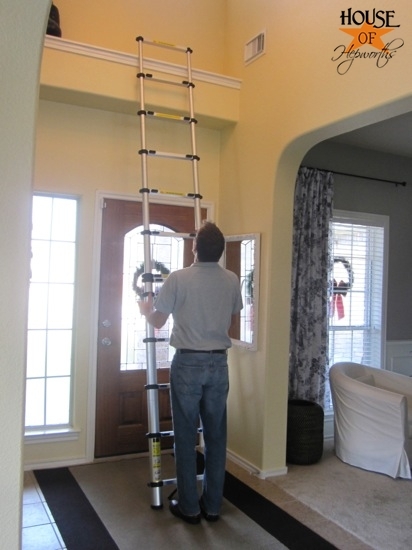 I couldn’t wait till the give-away so my hubby and I chatted about the multiple uses of this fancy ladder and we used your coupon code to buy one! I am so excited I can’t stand myself…”hopping up and down on one foot” excited!! 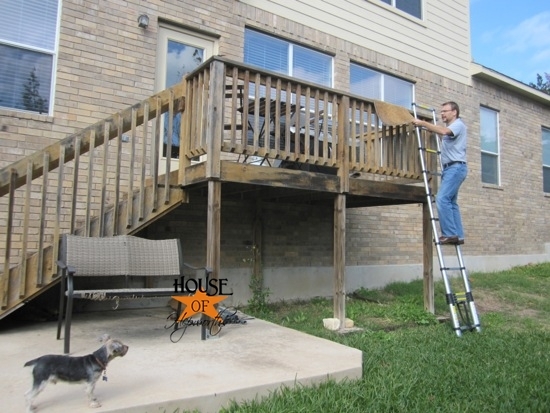 Wouldn’t have been able to handle the regular price of the ladder and the extra coupon code made it feasible for us. We just got a new home with this ridiculously but lovely high ceilings and windows and impossible to access art niches. With this handy-dandy ladder I can now dust and decorate BEFORE hubby arrives home and drags in the outdoor nasty ladder. Whoo hoo for me!!! Thank you for sharing! I “liked” Extend-a-step ladder FB page. By the way, I check HOH every single day and am SO excited when I see you have a new post…you make me laugh out loud…seriously…people in the office wonder about me sitting alone and cracking up at lunchtime. Checking you out from Houston…. You and your hubby made me LOL with those photos! Especially the silverware drawer one and the talking to Wilson. Good stuff! Thanks for the chance! This ladder looks awesome! It would be great to be able to use a ladder like this instead of the stairs! Maybe I could use it to reach the microwave above my stove too (or maybe hang one since I don’t actually have one!) There are so many projects that don’t get done because I don’t want to haul my aluminum ladder all over place. This would solve so many problems! Is it wrong to love a ladder?! Let me tell you about how I changed the batteries in the smoke detectors on the 12 foot ceilings in my house. I can’t levitate, so that option was out. I have a short step ladder, which wouldn’t reach nearly high enough. But I did have a sturdy wood kitchen table. Hmmm. If I put the ladder ON the table, I could reach the smoke detector. But what if the ladder slips while I’m on it? I’d end up broken and bleeding on my builder-beige living room carpet for possibly days (I live alone)! My dogs would be no help as they know they’re not allowed to use the phone, and barking for help would be futile as everyone in my subdivision simply ignores barking dogs. This could be serious. Then I spotted the perfect thing – my yoga mat! My cushy, blue, cheap-o-from-Walmart STICKY yoga mat. So I dragged that blankety-blank ridiculously heavy table into the living room, shoved it into place, slapped the yoga mat on it, and then wrestled the too-short ladder onto the table. By now I needed a drink. Nothing alcoholic in the house because I live in a dry county, and I keep forgetting to go to the next town to get some booze. But it’s probably not a good idea to get tipsy at this point anyway. So now my problem was how to get up on the table. How can overweight, ungraceful, klutzy me get on the table and stand up? I didn’t even need to hum this time – I knew the little step stool in the kitchen in the space between the fridge and the wall would do the job. And it did. I climbed up the 3 steps to the table, then up the ladder with a 9-volt battery between my teeth (don’t swallow, don’t swallow!). Actually changing the battery was a bit tricky, but do-able. I managed to get it put back together again, and carefully (klutzy, remember?) got off the table. Then I shoved the table & ladder over to the foyer and took care of the other smoke detector. This took an unbelievably long time. With a decent ladder, it would take only minutes (!) to change the batteries and live in safety. This thing is awesome!!! I would love to win this for my father. Such a great giveaway! Wow! Your husban is such a good sport! Very funny..needed this today after my 10 mile commute took 1.5 hours! (Amazing what a dusting of snow will do to travel time). I have a stairwell that this would definitely come in handy with! Hope you have a great day and thanks for the opportunity to enter this contest! I would love this….then the top part of my house would no longer be dusty! I would love to win that ladder! Our last repainting job in the living room is still unfinished, since we cannot reach all the way up the wall with our existing ladder! Does the guy come with the ladder? I could sure do with a handyman (or handy man?) around the house to get all our projects done! Not sure which I like better, the ladder or the post! Your husband must l-o-v-e you! ooo my husband is obsessed with getting a ladder. However, we have an apartment, so that would be silly. So this extend-a-step might be a good compromise! Then he can do all sorts of things with his ladder…..like clean out the top shelf of his closet!!! I need this ladder NOW! 1st, I’m a liliputian and can never reach ANYTHING, 2nd I need the lights on our house, 3rd my dad seems to think that putting his 80 ft ladder in our Taurus should be no problem, 4th my dads other suggestion was for David to lay down on the roof and put up the ligths! So being a vertically-challenged individual, this ladder would totally help me reach the top shelves in my kitchen cabinets! We moved into the house almost three years ago and ALL of the top shelves are empty because I don’t want to stand on the counters regularly to reach them. Oh, and then I could finally be taller than everyone else too! Thanks! You crack me up! I so look forward to your posts! Love Ben reaching for the silverware drawer! ha! Seriously…I do hope I win! I could totally use this ladder!!! I “liked” the Extend-a-Step FB page too! I’m loving this ladder and all of your husband’s uses for it! Liked them and commented on FB! 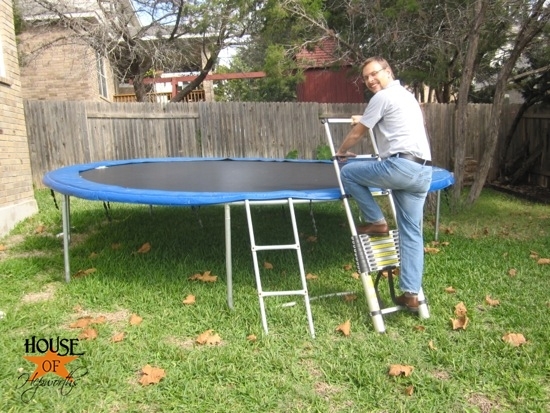 Dude…..this ladder is totally awesomesauce! And now I finally know the proper procedure for retrieving out of reach soft drinks and not so out of reach utensils! YES!!! Thanks Allison! This is the best giveaway I’ve ever entered (except for the HGTV dream house!). My husband refuses to put up any decorative lights outside…with this ladder I could do it myself! Wow, I wish I could extend my credit the way Extend-a-Step ladder extends! Please enter me in this very generous giveaway. Looks like such a handy and sturdy ladder. I could totally use this ladder for my dh’s Christmas gift. I am so tired of the lame excuse of “I can’t paint that because I don’t have a ladder tall enough”. Blah, blah, blah! This would allow sooo many more projects to be completed and off the to-do list! Lurve the Dr. Pepper pic. Extending the ladder all the way is ALWAYS more fun than using it the way it was intended. I am short and have a huge air filter for my central heat and air at the TOP of my stairwell!! Need this ladder!!!! I love that ladder! Our stairwell is so tough to paint, this would make it super easy. I “like” Extend A Ladder on facebook! I have a half painted inside stairwell… hahaha. We painted as high as possible and then stopped. My husband’s ideas for how to paint the rest sounded a little too dangerous to me, so a couple of months later it still sits half painted 🙂 Luckily it’s not too terribly noticible. But a ladder like this would be pretty sweet!! I loved your post. I loved the Dr Pepper shot. I have a little weak ladder that I use all the time. I’m on the short side and it seems everything is our of my reach. In the summer, I actually get on top of our arbor which is 9′ tall to trim the roses. Please save my life and send this my way. “H”oly “O”standing “H”ouse Ladder!!! This is a must have!! I like extend a step ladder on fb! So you are saying I could use this ladder to reach a drinking glass at my mother in laws house. Yep I am short she is tall and keeps the glasses higher than I can reach! Can you imagine the next time I go for dinner walking in with my ladder! Great uses for a ladder, especially for getting Dr. P and silverware! Totally left my husband all the painting work on our stairway as well – he was not happy with me! We have a HUGE 22′ ladder that is SO heavy and cumbersome to use. I would love,love, love to have something that is so easy to carry! Maybe we would get more projects done! So Funny! I love that you got Ben to pose for you, don’t think my hubby would. I could use it to change the litter box, that is ooh so high (4 inches) off the floor! If I won the Extend A Step, will it also make my husband do all of the things your husband did with it? hmmmmmm….could he use it to actually put dishes IN the diswasher, instead of next to it on the countertop? Could it make him pick up his underwear from the floor?? Now THAT would be amazing!!! I’m thinkin your hubby LIVES for these publicity stunts! 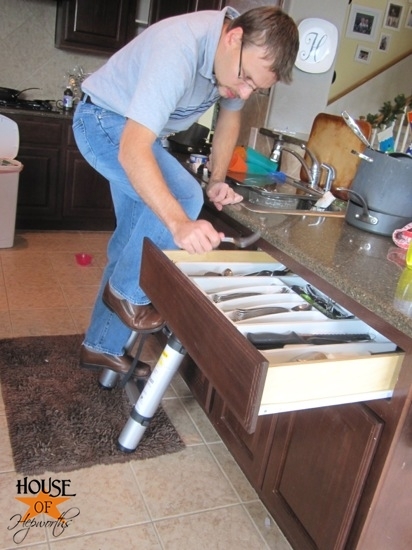 Good thing he’s as creative as you are – those silverware drawers can be killers, ya know! Glad to see he made it out alive on that one! ;^) And for the record…I love “real”, so much that I recreate it everyday at my own home! I hope my previous comment posted, but I LIKE them on FB now! Looks like a pretty ladder! This cracked me up. I would love to have one of these so I can reach the silverware drawer, too! No getting ‘board’ with this ladder (or these posts)…it’s all aluminum!! I love the obvious ways to use this ladder. You should make the winner post all their cool ways to use this ladder. I like Extend a Ladder on facebook and let them know who sent me. I need a ladder to paint my house! I liked them on facebook and need a ladder. I want this ladder. I would not share with my husband unless he was doing something I wanted him to do. It is that cool. I would just keep it for myself!!!! oooohhh I want one! Your husband is hilarious. Coolest ladder ever! If I won then maybe I could rescue Woody from the gutter above the garage. Every now and then I hear him scream “Help me Buzz!”. Man, I totally need this in my life!!! Boy do I need that ladder to paint my stairway! Love the funny pictures. I can’t come up with anything great to say that would top that post. But we really need a ladder so heres hoping! Ha! Love this post!! My fav was Talking to Wilson. You crack me up!! I’d love to win an extend a step so I reach those awkward spots when painting… Ok fine, so my hubs can reach those awkward spots!! that was hilarious! I love that ladder!!! Don’t have a plant shelf up high but do have high ceilings in several places! I need it for sure. That was hilarious! I love this ladder and have never heard of it before! It is awesome. I love how small it gets! Liked them on FB and left the message on their page. That ladder would SO help in finding new places to hide the leftover Halloween candy that I’ve been hoarding. The kids found the last spot in the china cabinet. Need to go higher. I so desperately want this extend a step. There are so many areas within the house that are out of reasonable reach AND outside…! That is a whole ‘nother story. Any solution not to lug around that huge wooden ladder would be an awesome Christmas present to ME. My comment didn’t post. Hope you got it … It was funny! I like Extend-A-Step’s facebook page! What a cool giveaway! You guys are too funny. I may have snorted a little bit when I saw the silverware drawer picture… and then it just got better from there. 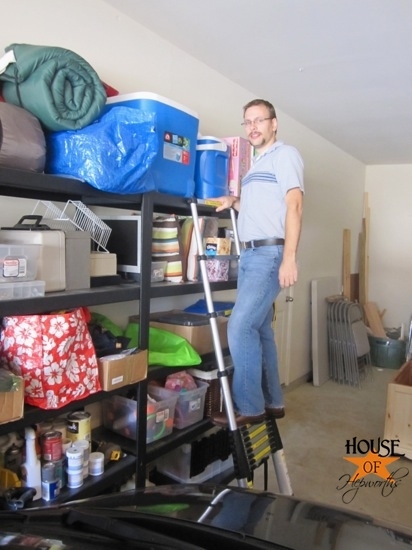 I Love your post on this ladder and the amazing and funny ways your husband demostrated. I would love to win this ladder for my house I’m only 5 1”, you should have seen me decorate my christmas tree on kitchen ladders and using the wall to hold my self up..lol. Love your blog, great giveaway! what a great giveaway as we have a very difficult time reaching our attic in the garage! sure would like this to get a leg up on all the projects I have. I would love this ladder. My friend got his wife one for her birthday, She LOVES it, and now I want one! Would love to win this, I could use it at my house cleaning jobs!!! “Like” the extend a step ladder on face book! 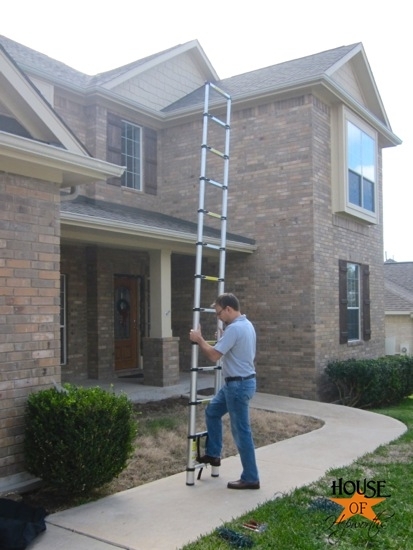 if my nearly 70 yo (dob 12/29/41) hsb is going to insist on climbing ladders and other things like it, he really needs this amazing ladder. It appears safer and he also loves compact easy to store items..
Way to totally burst my bubble!!! Had just told my husband I came up with the best invention ever…. To bad extend a step ladder beat me to it! …seriously brain think faster so we can make big bucks..LOL. My husband would looooooves this and I still haven’t bought him a Christmas present so I would loooove this for him!!! BTW you totally rock!! My heart skips a beat when I see you have a new post!! I like them on FB..whoot whoot!! !